​​​​Dr Gilbert Fan, ​Master Medical Social Worker at National Cancer Centre Singapore is here to provide guidance on coping with the psychological stress of cancer. ​​Cancer is so common in Singapore, yet many of us struggle to cope with it when it hits home. How do you cope when you’ve just been diagnosed and are awaiting treatment? ​How can you best support a loved one through cancer emotionally? ​Or how do you take care of yourself emotionally when you’re taking care of someone with cancer? 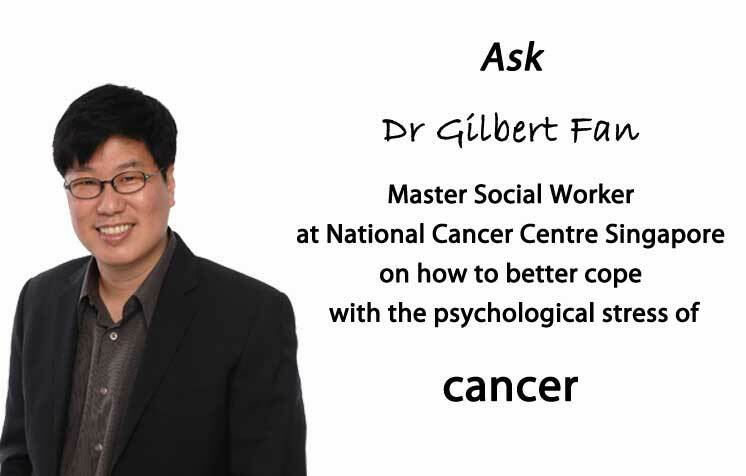 Take the opportunity to ask Dr Gilbert Fan about psychological stress and cancer​ ​​as well as the support networks available to you. This Ask The Specialist forum has closed on 31 December 2017. Dr Gilbert Fan, RSW, FAPA is a Clinical Supervisor (Satir), Fellow of the American Psychotherapy Association (USA) and Registered Social Worker. Gilbert’s professional doctorate is in Social Work & Futures Studies. He has extensive experience as a medical social worker, having worked in both general and tertiary hospitals and a short teaching stint at the Nanyang Polytechnic (NYP) lecturing in the Behavioural Sciences. He continues to teach in various capacities in social work and counselling programmes at both local and foreign universities. He is currently the Adjunct Senior Lecturer with the Department of Social Work, NUS and Honorary Senior Lecturer with the Department of Social Work & Social Administration, HKU. He has been appointed as Master Practice Leader by the Ministry of Social & Family Development in 2015 and Fellow of the Social Service Institute in 2016. Gilbert is the Chair for Volunteer Engagement, Co-Chair for Patient Support and Advisor & Master MSW to the Department of Psychosocial Oncology, National Cancer Centre Singapore. His clinical interest is in griefwork and bereavement, experiential counselling and groupwork, particularly in the application of experiential counselling of patients with advanced cancers. His research interests include the study of coping behaviours, meaning-making and intervention models in cancer care.